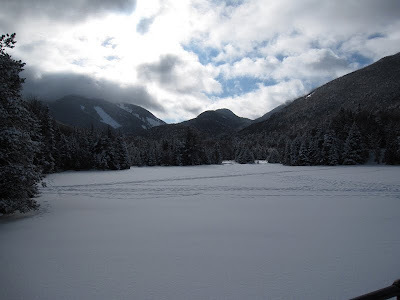 Walking around Lake Placid lately, it is difficult to remember Ralph Waldo Emerson's words were written about his time in these same Adirondack Mountains. He says in his journal-poem, "Adirondacs:"
"Or listening to the laughter of the loon; Or, in the evening twilight's latest red, Beholding the procession of the pines,"
That sounds far too calm to be the Village of Lake Placid, especially this month. Who knows, there might be a philosopher or two amidst the stream of visitors and athletes bustling around the Olympic Village. Things are hopping in Lake Placid; numerous athletic opportunities and competitions loom, including the World Cup Bobsled competition scheduled to begin today. Combine athletes with locals and visitors doing their holiday thing, and you'll find the hustle bustle energy is pretty high around the Village right now. At times like this it is tough to imagine a philosopher coming here to be inspired by Adirondack solitude. But indeed, in the 1850s, Emerson and his fellow philosophers reveled in the natural beauty and remoteness of the region. Quiet, solitude, and active time spent in nature is known to produce profound and deep thoughts. After all, even Albert Einstein was an avid Adirondack sailor. Fortunately, after a few days immersed in the busy energy of the Village of Lake Placid, you can easily take a page out of the Follensby Philosopher's Camp book and head to the wilderness. One of the many wonderful aspects about the Adirondacks is the convenient fact that you can be very close to the Village of Lake Placid and still have a wilderness experience. 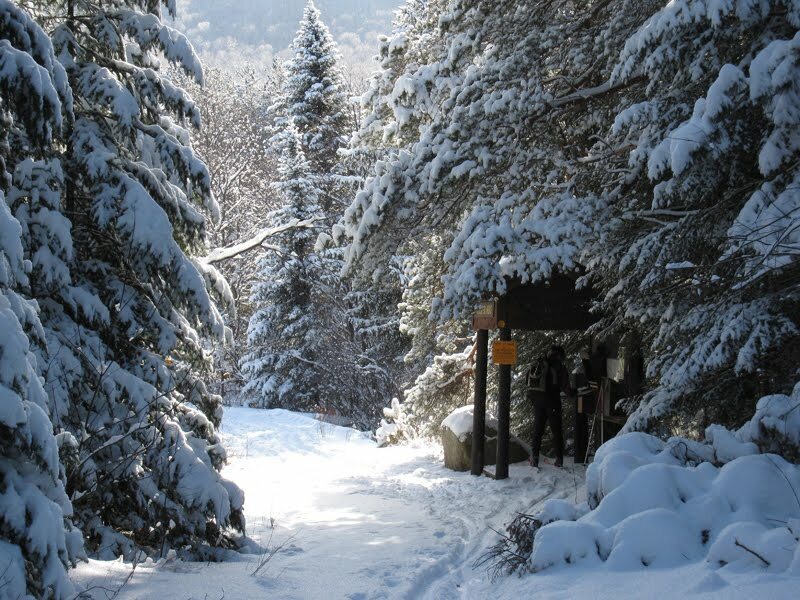 The Marcy Dam Truck Trail is a classic, minimal-snow conditions, beginner to intermediate backcountry ski excursion accessible a mere 12-minute drive from the Village of Lake Placid. The 2.8-mile truck trail is currently used only for emergencies, but it is well maintained and kept clear of blow down. The 10-foot wide trail ends at Marcy Dam Pond, a nice hot chocolate and cookies destination, complete with a great view. The terrain features gently rolling hills through mixed forest with several lovely brook crossings. 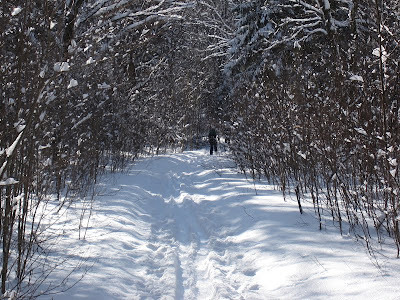 I recommend this trek to anyone interested in trying out backcountry skiing. Light-weight metal edged skis are handy, although touring skis work just fine in most conditions. To have a great backcountry and deeply philosophical ski experience just minutes from the Village of Lake Placid, pack up your skis and head out of town on State Route 73. A mile after passing the ski jumps on your right, turn right onto the Adirondack Loj Road. Driving directly into the High Peaks, proceed on the Loj Road for 3.8 miles until you see signs for the South Meadow Road/Lane. Park your car along the side of the road at the intersection and ski for a mile on the South Meadow Road until you see a gate on your right. 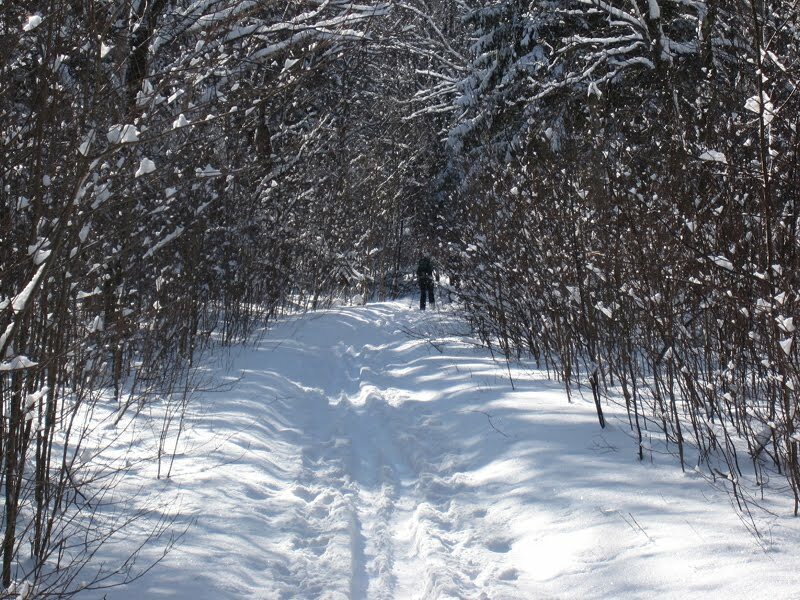 Make a right at gate, ski the gentle downhill for approximately .25 mile and sign in the trail register just before the bridge over South Meadow Brook. Don't forget the hot chocolate and cookies.